meSch - How Should DIY Technologies Serve Cultural Heritage Professionals? How Should DIY Technologies Serve Cultural Heritage Professionals? By Laura Maye on Tuesday, June 25th, 2013 in technology. This question was addressed by meSch at the ‘EUD for Supporting Sustainability in Maker Communities’ workshop held in the IT University of Copenhagen on the 10th of June 2013. The workshop was collocated with the fourth International Symposium in End User Development (IS-EUD). Through End User Development (EUD) the end user of computer systems is encouraged to create, modify and/or re-purpose these systems themselves. The theme of this workshop explored how EUD themes can encourage sustainability in maker communities. The workshop raised relevant topics for meSch, as one of goals is to create technology for cultural heritage professionals to link digital cross-media information with relevant physical materials without the need of expert knowledge, so in a Do-It-Yourself (DIY) way. Laura Maye, a meSch partner from the Interaction Design Centre at the University of Limerick, attended this workshop; furthermore, she presented a workshop paper to promote DIY technologies in cultural heritage. Are today’s DIY technologies apt for cultural heritage professionals? Participants were given 30 minutes to present their research, with an extra 15 minutes for questions. 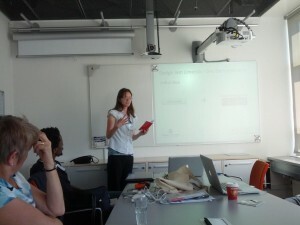 Laura presented her paper relating to DIY technologies servicing cultural heritage professionals. In her presentation, Laura argued that current entry-level DIY technologies do not provide apt levels of customization for novice users. DIY technologies that do provide apt levels, however, are too complex for cultural heritage professionals to use. Following this argument, Laura mentioned that the team at the University of Limerick will be conducting studies. One of the aims of these studies is to understand how DIY technologies should be created to service cultural heritage professionals. So, what should we keep in mind when conducting our research? Following the presentations, all of the participants discussed how EUD systems should be created to service end users. Overall, participants agreed that EUD systems should provide templates for end users to work from. This way, end users don’t have to create anything from scratch initially. Furthermore, taking advantage of technologies that end users are familiar with would ease the learning curve. Real time feedback would also help end users assess if their actions are meaningful. Overall, the workshop was a great success. The outcome from the workshop provided some key issues that all meSch partners should think about when conducting research. To find out more about the workshop, visit the workshop homepage or the homepage for the IS-EUD conference. Laura’s paper can be found in OUTPUTS or can be accessed directly via this link. The project (2013-2017) receives funding from the European Community’s Seventh Framework Programme ‘ICT for access to cultural resources’ (ICT Call 9: FP7-ICT-2011-9) under the Grant Agreement 600851.